In 1985 Walt Disney Pictures released Return To Oz, directed by the sound designer and editor Walter Murch. Set only six months apart, but made at opposite ends of the 20th century, Return To Oz and the Wizard of Oz exist in at once both the same and very different worlds. In Return To Oz Dorothy’s talk of a magical land of living scarecrows and great wizards results in her hospitalization and electro shock therapy. Escaping the hospital she finds herself back in Oz, where the yellow brick road and the Emerald City lie in ruins, and her friends have all turned to stone. Dorothy must navigate her way through this blasted landscape pursued by the mechanised half-human wheelers, literally picking her way through the ruins of the earlier film, its iconography dismantled and rewritten to speak of melancholy, loss , fear and paranoia – to speak perhaps of the difference between 1939 and 1985*. I don’t remember there being a happy ending to the film but apparently there was one. Ruins make us think of the past that could have been and the future that never took place, tantalizing us with utopian dreams of escaping the irreversibility of time. Walter Benjamin saw in ruins “allegories of thinking itself,” a meditation on ambivalence. At the same time, the fascination for ruins is not merely intellectual, but also sensual. Ruins give us a shock of vanishing materiality. Suddenly our critical lens changes, and instead of marvelling at grand projects and utopian designs, we begin to notice weeds and dandelions in the crevices of the stones, cracks on modern transparencies, rust on withered “Blackberries” in our ever-shrinking closets. The two highest grossing films of 2015 were Star Wars: The Force Awakens and Jurassic World, both films that in both literal and figurative ways took place within the ruins of earlier films. In Star Wars: The Force Awakens when we first meet the lead character Rey she lives inside the ruin of an old Imperial AT-AT and scavenges for parts in the remains of Star Destroyers and other iconic structures from the earlier films; recycling and repurposing material from the past whilst she waits patiently for that very same past to return. Her adversary Kylo Ren meanwhile is equally preoccupied with looking backwards, manufacturing a shrine from the ruined facemask of his grandfather Darth Vader; an image that conjures Walter Benjamin’s description of the ‘death’s head’ as everything ‘untimely, sorrowful and unsuccessful’ about history. These are young characters that (perhaps in sympathy with their young director) are caught in the hinterland of recent history, the ruins of which still litter both the physical landscape and our collective imagination. Both appear to see these ruins as the means to enact an impossible return; a blueprint for a doomed attempts to recreate an imagined past in an uncertain future. Whether the director himself is merely recognising this desire or is his himself seduced by it, is open to question, though tellingly his sympathy certainly seems to be with the historical scavenger rather than slavish devotee. The film ends with another return, a final blast from the past, as Rey arrives at Luke Skywalker’s hidden island retreat. 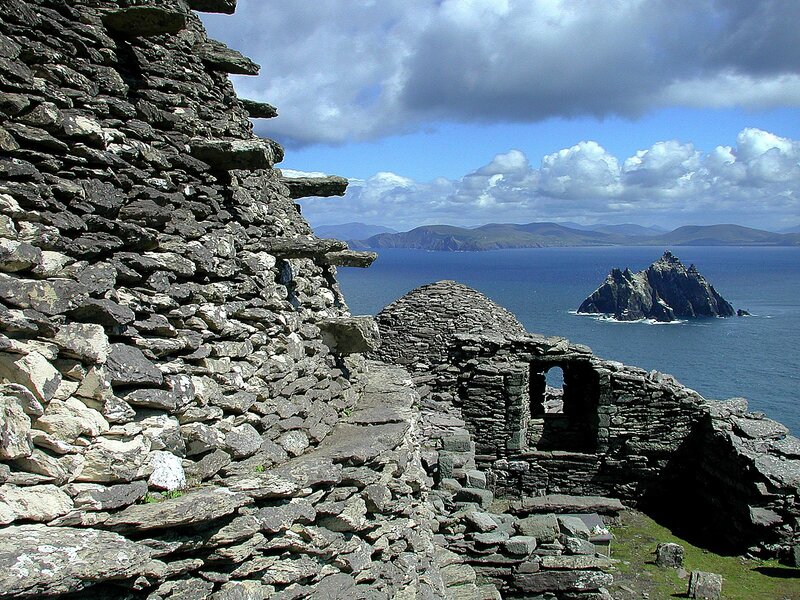 This scene was filmed on Skellig Michael off the coast of Ireland, itself the site of another famous ruin, that of a thousand year old Christian monastery. Here the melancholy presence of this ancient structure has a strangely disruptive effect on the cinematic universe, highlighting the inescapable modernity of this Hollywood mythology and the artificiality of the nostalgia that has been integral to Star Wars from the opening four words of the very first film. There is a haunting taking place, but I am not sure who is haunting whom. The past haunting the present. The imaginary haunting the real. The real haunting the imaginary. It is spooky. I am spooked. In their obsession with ruins, perhaps what we are seeing in these films is cinema recognising itself as a ruin, as historical artefact; a site of nostalgia and of the ‘shock of vanishing materiality’. After all, what do we see when we watch those earlier films? We no longer marvel at the scale and grandeur of their cinematic vision, but instead we begin to notice the weeds and dandelions in the crevices. We see the distance between now and then in the fading of their colours and the obviousness of their blockbuster special effects. They no longer transport us to another world in quite the same way they once did, but instead seem to point to the passage of time itself and in doing so to nostalgia, loss, melancholy and absence. By embodying these qualities through their inhabiting of ruins perhaps Jurassic World and Star Wars recognise the different place that cinema now plays in our lives and the different meanings that we ascribe to it. Perhaps what these two nominally science fiction films tell us more than anything is that we now understand cinema as something that belongs more to the past than it does to the future.